You can’t go wrong with chocolate cake! And if you’re looking for a festive take on your standard chocolate wedding cake, how about adding bright red flower petals to alternating tiers? This cake uses a devil’s food cake and chocolate buttercream icing (so divine!) 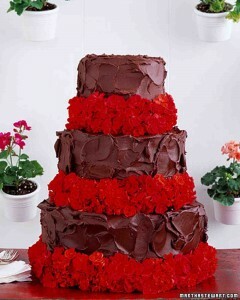 and then added foam tiers between the cake with red geraniums. If you don’t like that flower you could always choose red roses or another color completely. Bright pink blooms would be stunning on this cake too! Your guests will definitely be wowed with this chocolate confection! You’ll find this cake here.